Good evening. 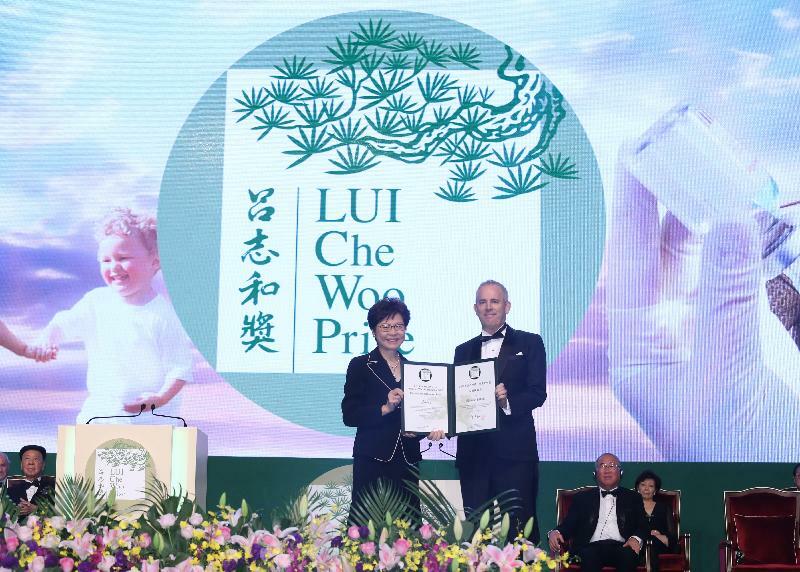 It is my great pleasure to join you for this year's presentation of the Lui Che Woo Prize – Prize for World Civilisation. First and foremost, my warmest congratulations to this year's laureates: Mr Xie Zhenhua for the Sustainability Prize; Landesa for the Welfare Betterment Prize; and the International Paralympic Committee for the Positive Energy Prize. I am sure you agree that this year's winners all demonstrate the qualities and values that we need in order to create a sustainable, caring and inclusive world. Upholding core values is essential, and this is especially the case today. Rarely in recent history has the world faced so many pressing and diverse challenges at the same time: climate change and natural disasters, poverty and forced displacement, the rise of extreme politics and armed conflict – these are the topics that seem to dominate headlines on a daily basis. 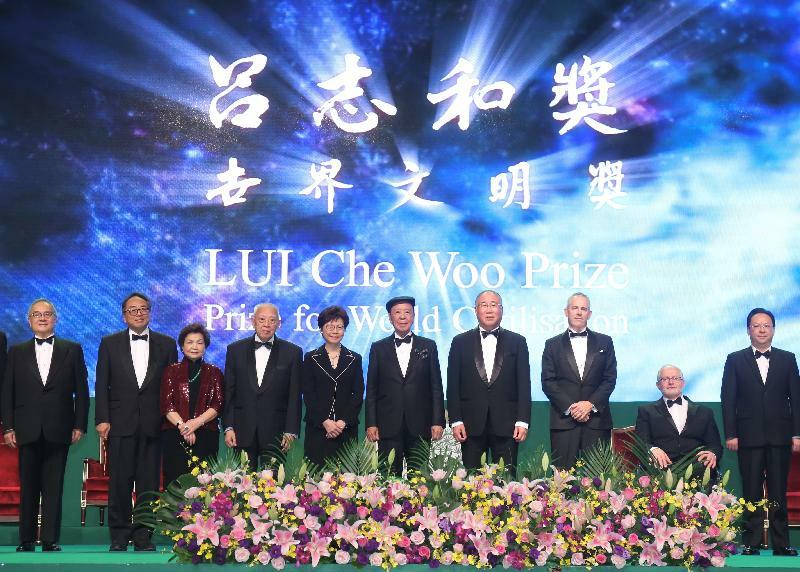 The areas of focus chosen by the Lui Che Woo Prize this year, namely prevention of climate change, alleviation of poverty, and promotion of harmony among diverse groups, are indeed very relevant to today’s situation. I believe that in the 21st Century, we have unprecedented resources to tackle the challenges: our world is more prosperous, more technically advanced and more interconnected than ever before. I believe that we should all make a little extra effort to improve the environment and help our fellow citizens. Of course, this is easier said than done. To motivate positive change we seek inspiration. Here, we need look no further than the Lui Che Woo Prize and its worthy recipients. Together, you serve as a great source of inspiration to others to build a better world together. Mr Xie (Xie Zhenhua) has channeled his political experience and diplomacy skills to the goal of curbing climate change. He has sought global solutions for this global challenge, including international negotiations that led to the successful conclusion of the Paris Agreement in 2015. He has also championed the cause in China, making significant contributions to mitigating climate change in the world's second-largest economy. Landesa identified the importance of land ownership in lifting people out of poverty. Over the past 50 years, Landesa has worked in many of the poorest parts of the world, finding solutions in different communities to achieve its goal of "helping people to help themselves". Landesa has assisted more than 120 million poor families around the world to secure land rights and plan for a brighter future. And the International Paralympic Committee (IPC) fully deserves its own "gold medal" today. I remember that, when Hong Kong hosted the Paralympic Equestrian Events of the 2008 Beijing Games, spectators were truly moved and inspired by the achievements of the competitors. IPC, through its many events in many countries, gives Para-athletes a chance to shine on the world stage, and, even more important, it gives hope to people with disabilities and promotes a more inclusive and compassionate society. So, once again, I congratulate the award winners. But it is also important to remember that, to make positive change, we don’t have to be great athletes, accomplished diplomats or part of a global organisation. We can all do a little more to recycle waste and conserve energy, show compassion for our fellow citizens and support and encourage people in need of a little extra help. As Hong Kong's Chief Executive, I am also abundantly aware that my government and I must lead by example. In my previous capacity as the Chief Secretary for Administration, I chaired the Government's Steering Committee on Climate Change. After months of hard work, we published Hong Kong's Climate Action Plan 2030+ earlier this year, outlining the Government's longer-term action in combating climate change and setting out the carbon emission reduction target for 2030. I have reaffirmed my commitment to this cause in my election manifesto. In particular, I will aim to reduce Hong Kong's carbon intensity by 65 per cent to 70 per cent by 2030 compared with the 2005 level, and gradually replace coal-fired electricity generation by clean and renewable fuels. As the Chief Secretary for Administration I also chaired the Government's Commission on Poverty since its re-establishment in 2012. During my term, the Commission had spared no efforts in taking forward various initiatives from setting for the first time, the official poverty line in Hong Kong, formulating and launching the Low-income Working Family Allowance, to enhancing the upward mobility of young people with grassroots background and furthering the work of the Community Care Fund and social innovations. As the Chief Executive now, I will monitor closely the implementation of the various initiatives. I will continue to chair the annual Commission on Poverty Summit to garner first-hand information through listening to the disadvantaged and consider policies to remedy deficiencies together with them. And promotion of harmony among diverse groups is my priority as the Chief Executive. Hong Kong has been suffering from quite a serious divisiveness and has accumulated a lot of frustration. I will endeavour to heal the divide and to ease the frustration – and to unite our society to move forward. It will take time, but my observation in the past three months is that we are moving towards the right direction. Next week, I will deliver my first Policy Address. I look forward to setting out my vision and goals for Hong Kong in the coming five years. Regarding content of the Policy Address, of course, I cannot give much away as yet. However, I can assure you that my policies will be guided by core values that we all share: strengthening education, caring for the disadvantaged and promoting an inclusive, harmonious and proactive community. Last, but by no means least, I also take this opportunity to commend Dr Lui on his remarkable achievements in business and in the community. As many of you would know, Dr Lui did not have the benefits of a high-quality education or wealthy childhood. He worked his way to the top. Today he is known for his philanthropy and as much as for his business achievements. 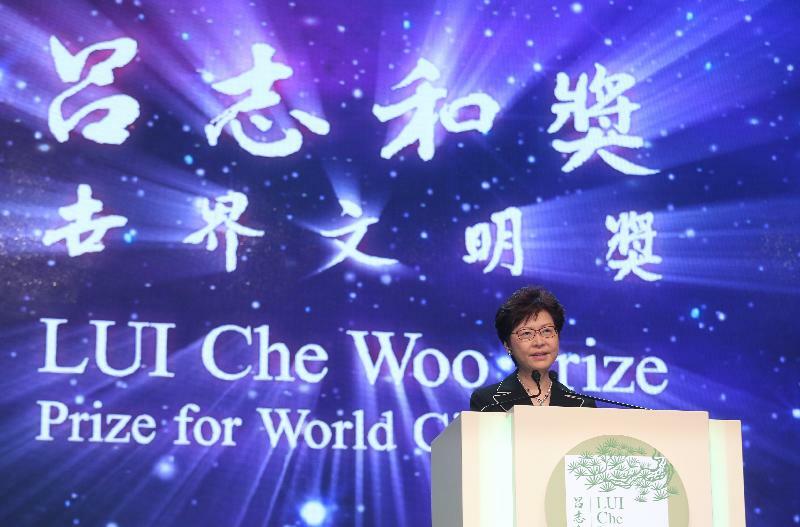 Through the Lui Che Woo Prize, I hope that more of our younger generation will be inspired to face challenges and make their own success in whatever field they choose. Tonight standing here, I want to also say something about this wonderful city, Hong Kong. Last week, I presided over the presentation of Shaw Prize tovery distinguished scientists, medical doctors and others. And later this year, I have agreed to present prizes at Yidan Prize for Education. So for a small place like Hong Kong, we have throughout the year, three distinguished international prizes to recognise people of international standing. This speaks for itself that Hong Kong is an international city that deserves our pride and our support. So finally, I just want to wish you well on this occasion. Ladies and gentlemen, I know that we can count on each one of you "to build a better world together". On that note, I wish you all a very enjoyable evening tonight and a great Mid-Autumn Festival.